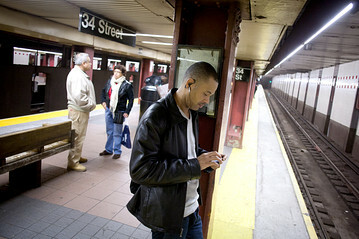 As a frequent subway rider, I’m often underground and out of range of wireless networks when I fire up my smartphone apps. Turns out, this happens a fair amount of time, according to analytics firm Localytics, which found that 15 percent of app launches happen offline. For all our talk of improving 3G and 4G and the proliferation of Wi-Fi networks, that’s a fair amount of offline app launches, suggesting our wireless connectivity needs to improve and app developers might be well served by building in more offline use for their apps. We griped about this last fall in a post about the need for more offline access for apps and a better transition between offline and online experiences. While many games and apps are totally usable offline, a lot of apps are shortcuts that take you to online content. But they’re rendered pretty useless when you’re out of range. But if 15 percent of app launches are offline, that means a lot of users can’t make use of an app, even for some simple uses. That has made me rely on certain apps like Instapaper to help me read content while I’m underground. But more developers should try to build this type of offline access or time-shifting into their apps. Or at least cache some of your data so apps aren’t completely useless. I think it would be great if apps could also sense when they’re in Wi-Fi range and use those times to update information automatically so there’s some current data available. Google Maps for Android (s goog) is an example of an app that has integrated more content for offline use. The app, updated in December, is able to pull up a full and pretty detailed map even though it’s out of wireless range. I’m not sure if all developers can go to those lengths, but it’s great that Google Maps offers some kind of service while offline instead of throwing up a warning notification. I understand caching of a lot of information can be hard. And it can eat up data usage, which is getting more precious with mobile broadband caps emerging. But I don’t think app developers need to make their full offering available. They can offer some evergreen information or light functionality while reminding people they are offline. That can at least keep people engaged with your app, which is an important goal for developers. Localytics — a real-time mobile analytics firm for app publishers on iPhone, iPad, (s aapl) Android, BlackBerry (s rimm) and Windows Phone 7 (s msft)– used its own product to come up with the data on offline use, by reporting on the type of connection used and looking at the time difference between when an app was opened and when analytics data was uploaded. It has something to gain from this news and is pushing its analytics products which can cache usage data while offline. But it shows connectivity isn’t a given at all times, and that can be an opportunity for developers if they take that into account in their apps more. Coming from a mobile apps developer, this makes sense. Wifi and 3G are not available everywhere. There are certainly many times when you need the function of an app without the need to go online. This makes sense. I know that I’m most likely to load games or other apps that don’t require online access when I’m on the subway. interesting, In india here as well, we have launched offline mobile app to find city bus,Auto rickshaw/taxi/cab fare and first question from tech-people was “Why offline” but that has worked ! Happy to share more details.